1. If a sum of Rs. 1,170 were distributed among A, B and C in the ratio 2:3:4, by mistake, m place of ½ : 1/3 : 1/4 , who was benefited most and by how much ? 5. Average of 11 numbers is 36, whereas average of 9 of them is 34. 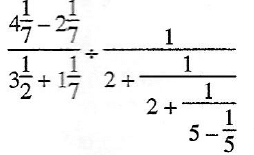 If the remaining two numbers are in the ratio of 2 : 3, find the value of the smallest number (between remaining two numbers). 7. Of three numbers, the first is 4 times the second and 3 times the third. If the average of all the three numbers is 95, what is the third number ? 8. If average of two numbers x and 1/x (where x ≠ 0) is A, what will be the average of x3 and 1/x3? 17. 25% of annual salary of A is equal to eighty percent of annual salary of B. Monthly salary of B is 40% of monthly salary of C. Annual salary of C is Rs. 6 lac. What is the monthly salary of A? 18. Two numbers are less than a third number by 30% and 37% respectively. How much percent is the second number less than the first ? 20. Of the 1000 inhabitants in a town 60% are males of whom 20% are literate. If of all the inhabitants, 25% are literate, then what percentage of the females of the town are literate ? 77. On simplification, the expression is equal to. 78. Sum of three fractions is 2 11/24. On dividing the largest fraction by the smallest fraction, 7/6 is obtained which is 1/3 greater than the middle fraction. 84. A does half as much work as B in three fourth of the time. If together they take 18 days to complete the work, how much time shall B alone take to do it ? 87. A and B do a piece of work in 15 days. B and C can do a similar work in 12 days and C and A in 10 days. How many days will A take to do the work by himself? Directions : Study the following graph which shows the production (in thousands) of different items, and answer the questions from 96 to 100.